The days of putting your ear to the ground detect approaching cavalry are over. Now nations sport systems like the Iron Dome, THAAD radar, and these nine all-seeing early warning systems from our friends at Oobject. Really, there's no use hiding. If you can't see them coming a mile away already, be sure to check out these 18 radio telescopes, these incredible listening devices, and these awesome astronomical aides. In the original designs of these acoustic mirror, a curved recess in the concrete bounced sound towards a listener wearing a stethoscope. The Woodpecker signal was a mysterious repetitive short wave radio frequency emanating from the Soviet Union during the Cold War. It later turned out to be part of a long range early warning system based in Ukraine. One of 23 satellites in this system, which can detect the heat signature of missile launches. Shown here, being deployed from the Shuttle. 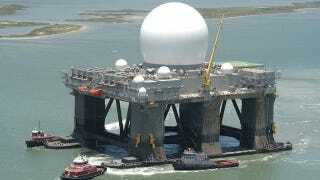 A floating radar platform that is used, among other things, to detect North Korean missile launches, from it usual home in the Pacific. Part of the Distant Early Warning or DEW line, against a Soviet airborne or land based attack over Canada.